Below are listed some interesting photographs, images, exhibition and other visual materials. Click on the image to see a high-resolution view, visit a gallery, or be directed to an external website. Voyage dans le cristal was a major exhibition shown in 2009 in Grenoble and other French cities, and the basis for a presentation at the 2012 Bragg Centenary Symposium in Adelaide. The exhibition presents to the general public the science and the beauty of matter in the crystalline state. The exhibition was mounted with the contribution of numerous partner laboratories under the management of the Grenoble Museum of Natural History and the French Association of Crystallography. Voyage dans le cristal recounts humanity’s interaction with crystals, through art and science, from prehistoric times to the present day. It invites the public on a voyage to discover crystals in their many aspects: their wonder and mystery; their place in the history of science; their use in multiple contemporary applications. In 1913, following the discovery that crystals produce patterns when subjected to X-ray bombardment, father-and-son team William and Lawrence Bragg formalised the laws of X-ray crystallography. In 1915 they won a Nobel Prize for their work – Lawrence, at 25, remaining to this day the youngest winner. 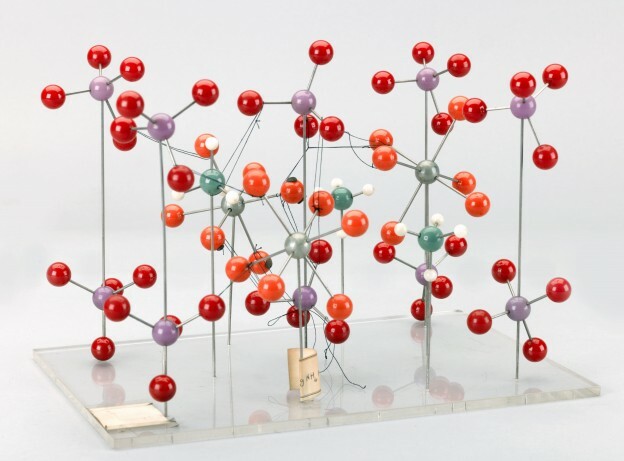 To celebrate the centenary of X-ray crystallography, the Science Museum in London has opened Hidden Structures, a new display of molecular models made using the technique, that will run from 7 March 2013 to 1 January 2014. This book exhibit, held at the University of Illinois beginning in April, 2012, commemorated the 100th anniversary of the discovery of X-ray diffraction. The exhibit highlights approximately 30 key books that illustrate the development of crystallography from ancient Greece to modern times. The scientific discoveries in these books record the evolution of crystallography into one of the key scientific techniques that enable us to understand the structure of matter and the world around us. The exhibit also includes crystal specimens chosen to highlight some of the ideas presented in the books.